An article in the Winter 2017 Newsletter discussed the importance of obtaining a good quality soil sample. That's the critical first step. But then what? Once the sample is analyzed, what should be done with the report? The information on that soil test is essential to the Retail Partner or grower understanding the condition of the soil and how to determine nutrient recommendations. The first section of the soil test to review is the pH, CEC, and percent base saturation section. We get a general indication of the soil texture by the CEC. A soil with a CEC below 8 is considered sandy, whereas a soil with a CEC between 8 and 14 is a medium textured, or loamy soil. When a soil has a CEC higher than 14 there is a fairly high clay content. Those values are not hard-and-fast rules, but generally, the higher the CEC the more clay and organic matter the soil contains. 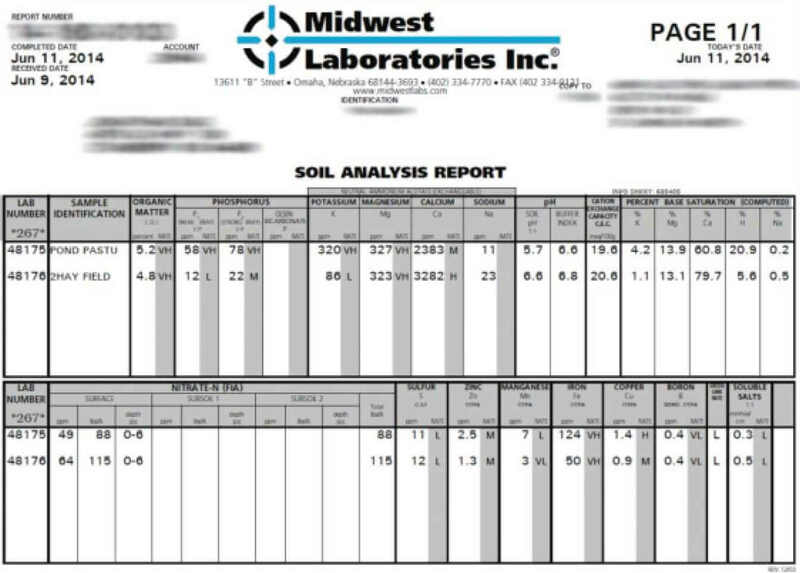 An example soil test report from Midwest Labs. As you can see, the report is complete, showing organic matter, pH, Cation Exchange Capacity, Base Saturation, and nutrient levels - including micronutrients. Soil pH has a direct effect on nutrient availability. This chart shows relative nutrient availability at various soil pH levels. 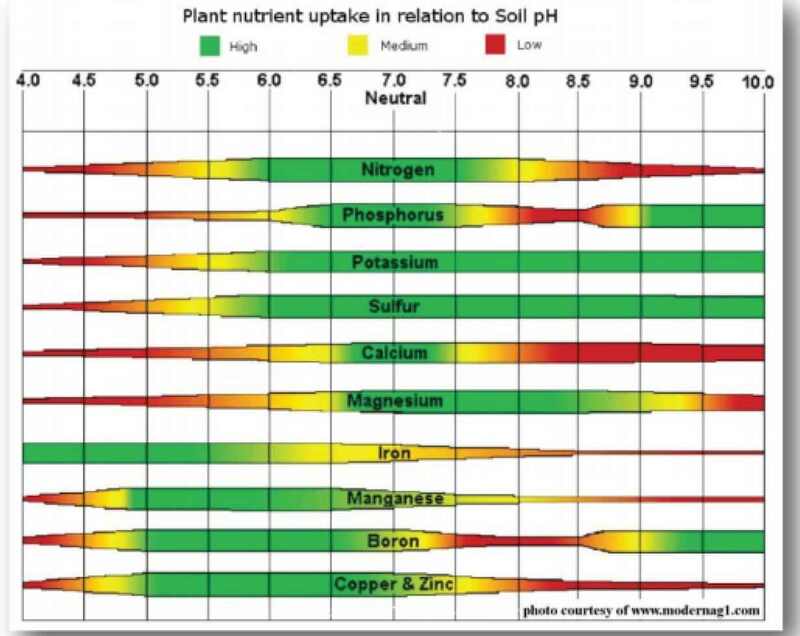 Most nutrients are readily available when the soil pH is 6 - 7.5. Notable exceptions are aluminum, where availability drops substantially at pH levels greater than 5, and iron & manganese where availability drops starting at pH 6 and higher. It is also important to note that most bacteria and fungi are most active in soils with pH above 5.5. Base saturation is the ratio, or proportion, of the amounts of potassium, magnesium, calcium, hydrogen, and sodium in the soil. Having the soil's calcium base saturation level between 65 - 75%, magnesium level between 10 - 18% and potassium level between 3 - 5% provide the best opportunity for all nutrients in the soil to be available, good soil structure and water holding capacity, and good microbial activity. When those nutrients are in their desired ranges, soil pH is usually in the upper 6s and 7s. Simple calculations to help determine the amount of calcium, magnesium, or dry potash amendments needed to make base saturation adjustments are available. Let's turn our attention to the crop nutrition we will need to provide during the growing season. Nitrogen recommendations have been well researched for many crops. Most crops have nitrogen recommendation equations that account for yield goals and soil residual nitrogen. Other factors to consider may include nitrogen credit for previous crops. Nitrate nitrogen is a very mobile nutrient in the soil because it has a negative charge and doesn't attach to soil particles. Although the recommendation equations are a very good starting point, environmental factors such as rainfall, temperatures, and water saturation will influence nitrogen presence in the soil. Phosphorus plays a major role in crop production - from the earliest stages of growth through the fruit production and maturity. When recommending phosphorus - or any nutrient - the yield goal is important. Phosphorus recommendations depend on yield goal and the readily available phosphorus in the soil. That value is found in the Bray P1 column when soil pH is less than 7 and the Olsen Bicarbonate column when the soil pH is greater than 7. Some labs use the Mehlich 3 extraction process to determine available phosphorus, which is not dependent on soil pH. P2O5 recommendations also take into account whether there is low, adequate, or high levels of phosphorus in the soil. Applying the amount of P2O5 needed to grow the crop and taking advantage of the nutrients already in the soil will provide for good crop production and reduced potential for environmental problems. The actual amount of P2O5 needed to grow the crop will vary by crop and yield goal but if the phosphate level is less than 30 ppm most crops will respond to supplemental P2O5 application. Crops that are often planted in cool, moist soils, such as corn, will benefit from a small amount of P2O5 applied at planting, even in high phosphorus soils. Many crops, especially legumes, fruits, and vegetables, have a high demand for potassium. It is necessary for fruit production and water relationships in the plant, among many other functions. When recommending K2O, the yield goal is the first piece of information to be collected. However, in addition to yield goal, the CEC of the soil also figures in to making recommendations for potassium. In sandy soils a potassium level of 150 - 175 ppm is considered adequate for most crops, and in higher CEC soils that value is upwards of 200 - 225 ppm. Those values are reasonable for row crops such as corn, soybeans, and wheat, but may not be adequate for crops and have a high demand for potassium. Sulfur is vital to high yielding, high quality crops. It is not required in as high of rate as N, P, and K in most crops, but it is just as vital to plant health. Sulfur recommendations are based on several factors including CEC, organic matter, and pH. A rule of thumb to use for determining sulfur need is that most crops require 1 lb of sulfur for every 10 lbs of nitrogen the plant needs. Most crops will respond to sulfur applications when soil sulfur level is below 25 ppm. The last section of the soil test is the micronutrient section, but the term "micro" does not mean that they are unimportant. In fact, having the proper amounts of micronutrients available to the crop is as critical to yield and quality as N, P, and K. Micronutrients are needed in much smaller amounts than other nutrients, but again, they are every bit as important as the other nutrients for proper crop growth and production. Crops such as corn, soybeans, apples, cotton, and tomatoes respond very well to additions of zinc, boron and manganese when the soil test calls for it. Crops such as wheat respond most to iron and manganese. Small amounts in the soil are extremely important, however excessive amounts can be phytotoxic. There is a lot of information on a soil test analysis report. For additional information, or assistance in using soil test reports to develop a crop nutrition plan, contact an AgroLiquid Retail Partner [Tyree Ag], or AgroLiquid representative. *This artcile was in AgroLiquid's 2018 Spring Quarterly Newsletter.